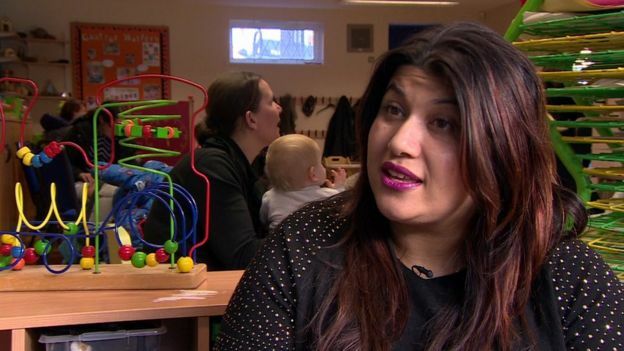 Alka Dass, from High Wycombe, describes her local children’s centre as “a lifeline”. But the centre, along with 35 others in Buckinghamshire, faces closure under acouncil plan to replace them with nine “community hubs” and save £3m a year. A new analysis by a children’s charity accuses ministers of undermining England’s network of children’s centres and making them vulnerable to cuts and closures by cash-strapped local authorities. The Action for Children report focuses on the government’s decision to suspend full Ofsted inspections of the centres in September 2015. Since then, almost 1,000 centres have been due for their five-yearly inspection – about a third of the total, says the charity. “If these centres aren’t inspected they are invisible and what that means is that it’s much easier to close them,” Action for Children chief executive Sir Tony Hawkhead told the BBC. He says the temporary suspension was originally meant to allow Ofsted to look at how it inspects children’s centres and get its inspection framework and standards absolutely right for the 21st Century. In response, the Department for Education said it was determined to improve early years provision, adding that, despite the suspension of full inspections, “robust and regular” partial inspections, focusing on early education and childcare at the centres still take place. “Local authorities which manage children’s centres must also ensure that other services provided in the centres have appropriate safeguards in place,” said a DfE spokeswoman. “While it continues to drag its feet, central government is letting down tens of thousands of children and families who need support now,” said Sir Tony. “It urgently needs to push through its overdue review of early years services so children’s centres have clarity about how they should be working, what they should be achieving and the accountability framework they are working to. She says having a children’s centre close by in the weeks after the death of her mother and the birth of her son, was “massively important”. At the centre she says she was able to see professionals in a group, “talking about going through postnatal depression and also the grief I had been through”. Sir Tony says running down the vital early help provided by children’s centres is a false economy. In a statement, Ofsted confirmed that full inspections of children’s centres were still suspended, adding that the policy was a matter for the DfE. “Councils have been forced to redirect the funding that remains to protect those children at immediate risk of harm, leaving less money available for early help services such as children’s centres,” said Richard Watts, chairman of the LGA’s Children and Young People Board. Mr Watts agreed that it would be helpful for the government to review its expectations of children’s services to make the best use of limited resources and boost social mobility. The DfE spokeswoman said the government had also “invested £200m to develop new and better ways of delivering children’s services to ensure they are high quality and meet the needs of families across the country”. “We believe it is up to local councils to decide how to organise and commission services in their areas.